Addleshaw Goddard, BLM, Clyde & Co, Herbert Smith Freehills and Kennedys are among the firms in the running for the flagship Future of Legal Services Innovation Award at the Legal Week Innovation Awards 2018. The quartet are joined by Macfarlanes, Shoosmiths, Simmons & Simmons and Ward Hadaway, in a category designed to showcase the firms seeking new ways to provide legal services. The awards, which are hosted by Legal Week in association with sister titles The American Lawyer and Legaltech News, will take place on 25 May at The Brewery in the City of London. They set out to celebrate the contribution made by lawyers and non-fee-earning staff to the success of their businesses, and cover disciplines including BD, finance, IT, project management, operations, PR and recruitment. This year, the awards recognise the emergence of legal operations as a discipline. Shortlisted in the Future of Legal Services Innovation – In-house Legal Operations category are: Coventry Building Society, Hitachi Consulting UK, Macquarie/D2 Legal Technology and Network Rail Infrastructure. The role of suppliers in developing new technologies and processes is also recongised, with four supplier categories, divided into technology, services, resource management and data security. There is also an award for international innovation, with Conyers Dill & Pearman, Dentons, Hogan Lovells, Magnusson, Ogier, Paul Hastings and Simmons shortlisted. 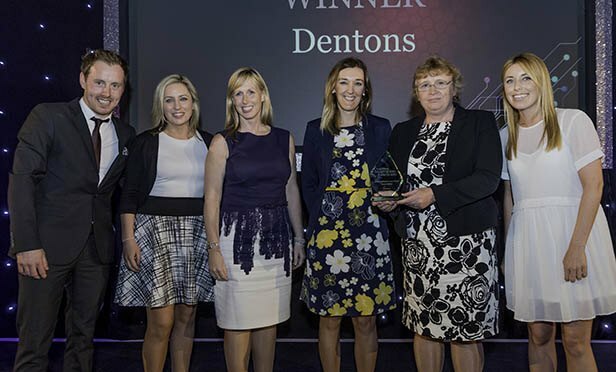 Dentons (pictured), DLA Piper and the Royal Mail Group were among the winners at last year’s awards. Dentons took home the International Law Firm Innovation Award for its efforts to build the world’s largest free-to-use lawyer referral programme Nextlaw Global Referral Network, while DLA Piper secured the prize for Client Management Innovation with its WIN initiative, a training programme for in-house lawyers. Meanwhile, the legal team at the Royal Mail Group saw off competition from Northern Trust, Tideway, the European Bank of Reconstruction and Development, The Board of the Pension Protection Fund and Vodafone to walk away with the Legal Department Innovation Award. The afternoon culminated with the award for Outstanding Legal Innovator, which was given to Raphael Mokades of diversity-focused recruitment agency Rare, which he set up more than a decade ago. Mokades has been recruited to this year’s judging panel, which also included writer and journalist Dominic Carman, Zach Warren, editor in chief of Legaltech News, and Julia Salasky, CEO and founder of CrowdJustice. Click here to read the full shortlist.